One way pallets are used in transportation and warehousing. Since one way pallets, in theory, are intended for one-time use, they are particularly often used by companies, that use their pallets for their export business. They are robust, durable and suitable for shelf storage. 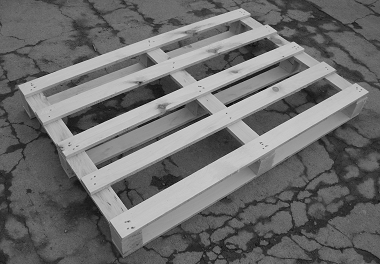 One way pallets are not subject to standards and therefore are obtainable in various different shapes and sizes. Depending on customer needs, a pallet can be fitted to transport a particular product. We manufacture customized one way pallets according to your specifications and/or design in any size, board thickness and any load. 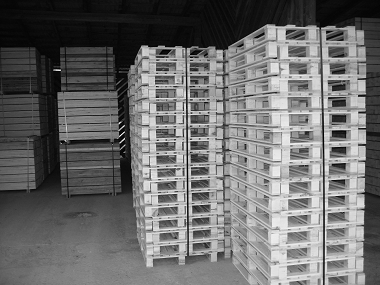 Our pallets are usually made of hardwood and can heat-treated and/or dried according to IPPC ISPM 15. In addition to our standard high quality offers we can provide you with products of cheaper quality. These pallets are particularly convenient, when there is no great value placed in material quality and they are being used for one-time transports. We constantly have a wide selection of ready-made one way pallets in standard EUR dimensions of 1200 x 800 mm in stock, so a rapid delivery can take place. Use our online form to get advised as soon as possible.